We’ve been ranked the third independent digital agency in the Design and Build Category, ranking 52 overall – leaping 20 places from last year’s Econsultancy report. 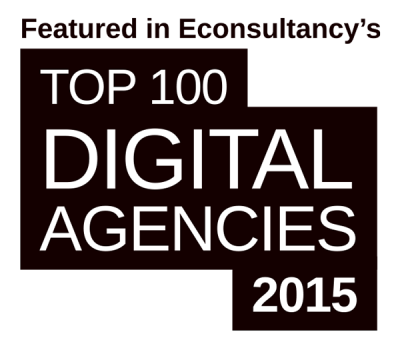 The top 100 report ranks agencies based on their total fee income from digital, it’s an independent overview of the most significant agency players in the UK which lists the UK’s top 100 digital marketing, design and build, technical and creative agencies. In 2014 we achieved strong growth increasing turnover by 54%, winning new clients such as City & Guilds, Organix and Keith Prowse. Most significantly, we expanded the delivery teams available with Agile teams working on site with clients. Our most recent site launch was the Get Into Teaching site for the Department for Education, with many more site launches in the pipeline for the rest of 2015 and beyond.